Blending raw, rhythmic desert sounds with driving 60s acid rock, The Green Door beckons the listener into a landscape evocative of the wild, uncompromising West themes of the 1960s with a mind-bending, psychedelic twist. Formed in San Francisco in 2008, the band is comprised of Mike Carnahan on lead vocals and guitar, Reese Abell on bass, guitarist Evan Wardell, and drummer Vanessa Wolter, as well as Devin Triplett on keys. The Green Door's atmospheric strumming juxtaposed with formidable signature riffs that coast atop pounding, driving beats send the listener's mind spinning off to the badlands beyond the border of sonic civilization. The result is a melodic reckoning force of American myth and counter culture ideology. Deriving their name from a Bob Dylan comment in the 1967 documentary "Don’t Look Back", the concept of a green door stands as an image of mystery enclosing the individual’s perception of the outside world. The Green Door takes reference from throw-back genres and low-fi records as well as American western iconography and legends, but looks forward in its artistic song writing approach, as is evident on their first full-length album titled The Green Door released in 2011. In this way their music has an avant-garde aesthetic, yet still feels familiar. The Green Door released their second album 'Wolf In The Fold' on December 15th, 2017. 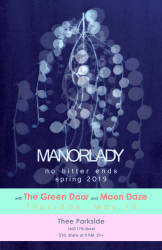 Manorlady are a family band. Melissa (bass, vocals) and Aaron Bailey (guitar, vocals) started Manorlady in 2009, with Melissa’s brother, Donald Wooley (keys), while living in Charlottesville, VA. Since 2009 Manorlady have made music inspired by the wide open spaces and fluorescent sunsets in the Mojave Desert of Eastern California. From the beginning, Aaron and Melissa’s harmonies have been embraced by dense guitar/bass/key textures and Cocteau-style beats. Melissa and Aaron moved to Santa Cruz and in 2016 Manorlady resurfaced in Santa Cruz, CA with the EP Barely Not Dead, playing live shows as a trio with new drummer, Conor Kelly. The band’s third LP, No Bitter Ends, is both enormous and concise and comes seven years after LP#2 Ego Oppressor. No Bitter Ends will be released as a double vinyl album on March 29, 2019 on the band’s own Part Keeler Recordings imprint. Dream pop / psych rock / garage rock based in San Frandisco, CA.